Based in a converted barn in the rolling hills of South Armagh, Tracey Mc Verry of Compass North Glass, designs and creates unique works of contemporary glass art, sculptural glass and bespoke craft glass. Tracey’s studio practice specialises in fused glass, kiln formed glass and architectural/sculptural glass incorporated into public art. Tracey studied in Fine Art Sculpture where she instilled a heavy reference to drawing within her practice. Heavily influenced by natural and social history, geographical and geological environments and meteorological activity, Tracey’s work investigates the ‘invisible line and light’ present in her influences and focuses heavily on both in her work. She strives to capture alchemic elements within her glasswork taking the viewer into a realm of intrigue and discovery. Each piece has its own story with a strong sense of place and belonging. Sharon works out of her studio, a recently restored two hundred year old mill in Mullaghbawn. The studio is equipped to facilitate a varied selection of art and craft workshops inspired by the majestic backdrop of Slieve Gullion. Sharon’s work reflects life in her native South Armagh. The mythical Ring of Gullion is rich in culture and unique scenery and many paintings depict famine ruins, historic landmarks, fairy trees, farm animals, traditional music and local characters. Recently Sharon has been drawn to old derelict dwellings. This has inspired her to create a series of landscape and still life paintings which provoke the viewer to reminisce about their own roots and childhood memories of growing up in a rural setting. To date Sharon has completed many commissions and her work has travelled to far off destinations in Europe, Australia, America, Canada and Dubai. Working from her ‘Cushla of Gullion’ studio high on Slieve Gullion in South Armagh, Caóilfíonn takes her inspiration from the beauty of her natural surroundings. Influenced by the colours, form and texture of the ever changing environment, rich in geology and heritage her textile work is a fusion of natural materials, found objects and upcycled fibres. Caóilfíonn’s photography centres around natural outdoor portraiture and local landscapes which she also translates into nunofelt and stitched wall hangings, making wonderful unique gifts. Her millinery and wearable art pieces are always quirky creations reflecting an individual flare. Working on a bespoke commission basis, tailored to specific clients need, Caóilfíonn also has a ready to wear range of scarves, hats, wraps and accessories available. 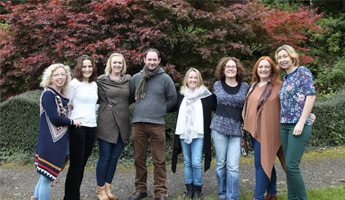 An arts graduate from the university of Ulster, Caóilfíonn continues to train with international tutors embracing both traditional and innovative emerging techniques, new technologies and materials. Caóilfíonn loves nothing more than exploring experimental fusions to challenge, yet still compliment older methods. Miley and Pat handmade ceramics are made by Mary Cowan in her studio in Dundalk, Ireland. The forms she makes, allows Mary to share her love of animals with her customers. While the work is based on birds, owls, cats and other creatures there is a correlation with human behaviour and emotion. Mary’s work shows simplicity of form and decoration yet attempts to capture quirkiness and personality. Her ceramic creations allow the natural texture of the clay to show through by decorating with underglazes, oxides and a limited application of glaze. Mary is a founding member of ROGHA and a graduate of University of Ulster, and BIFHE, Belfast. She has exhibited widely in the UK and Ireland and her work is in the collection of Louth County Council and in other private collections in Ireland and UK. Mary’s craft business ‘Miley and Pat handmade ceramics’ is named after her border collie dog Miley and his favourite housemate Pat the cat. Mary Larkin is a feltmaker. Originally from Castleblayney, in Co. Monaghan, she has lived in the village of Meigh in the beautiful Ring of Gullion for the past 15 years, where she works from her studio specialising in wraps, scarves and wall hangings. Trained as photographer and having worked in the field for several years, Mary wanted to diversify and so returned to college to indulge in her love of textiles. She was particularly drawn to the ancient art of feltmaking and has travelled at home and abroad to perfect her techniques. She draws her inspiration from the colours and textures found in nature and uses a variety and wool fibres and silks to recreate her vision. As a member of ROGHA, Feltmakers Ireland and Feltmakers North she has exhibited throughout Ireland as part of the collectives. Padraig’s studio is nestled in the valley between Slieve Gullion and her Ring of mountains in a recently renovated old mill. Once known as ‘The big house’, a place where the farming industry of bygone days held its finger tightly on the pulse. Now in more recent times ‘The big house’ lends itself to a more creative and artistic trade. It is here you will find Padraig performing the day-to-day tasks of his woodturning production, creating turned pieces from locally sourced trees. Padraig is not only a maker but also facilitates workshops teaching the craft, allowing others to enjoy the same satisfaction in producing a bowl or platter from the raw material. 'Inspiration is drawn from all around me, form, texture and proportion are all integral elements when I begin a piece.' Padraig is often asked to complete commissions, which allows the customer to lend their insight into the final outcome. Diane is a graduate from the University of Ulster at Belfast. Diane works as an Art Tutor with the Southern Regional College, Newry. Diane also runs her own part-time business “Personalised-Gift by Diane McKevitt", where she works from her home studio, creating bespoke personalised wooden letter crafts, commissioned paintings and mixed media artwork. Diane’s inspiration for her artwork is derived from all the things around her; Nature at its best, natures beautiful colours, wild flowers with their fantastic colours and shapes. Diane loves all things vintage and old, and creating her work, using old things, bits and bobs, old fabrics, papers, jewellery, coins, copper, etc. Diane’s art pieces involve lots of layering of materials to achieve her final outcome and are all very tactile. Diane’s Studio is open for tour visits, where visitors can see firsthand, her work process and techniques.